Performance Improvement Projects (PIPs) Technical Assistance for Florida Medicaid PMHPs August 21 st, 2007 Christy Hormann, MSW PIP Review Team Project. 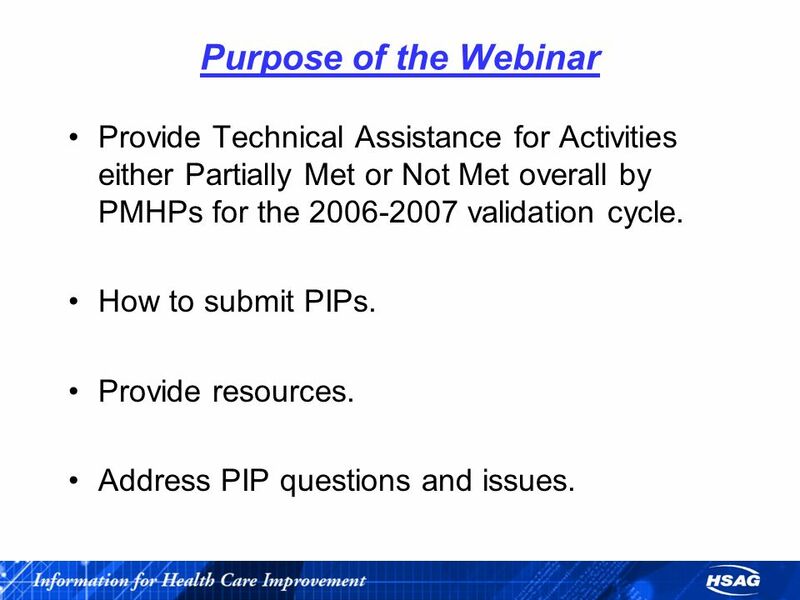 2 Purpose of the Webinar Provide Technical Assistance for Activities either Partially Met or Not Met overall by PMHPs for the 2006-2007 validation cycle. How to submit PIPs. Provide resources. Address PIP questions and issues. 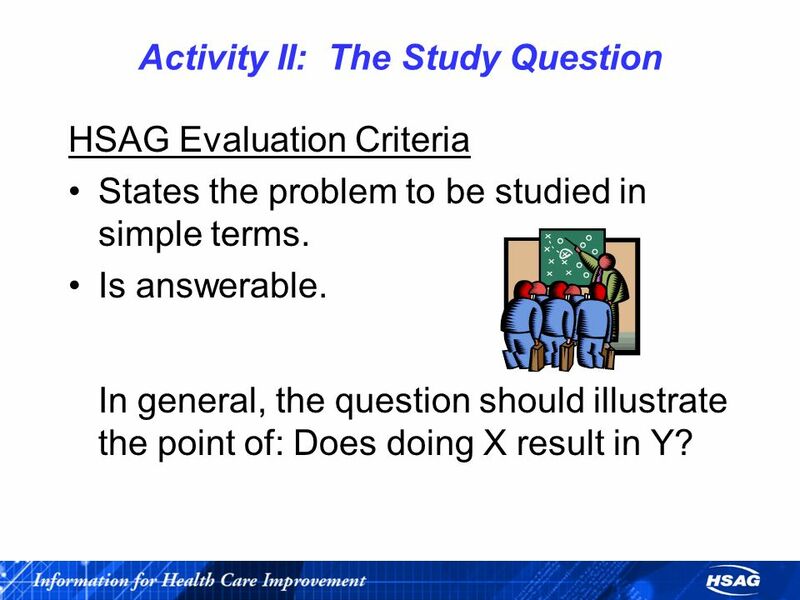 4 Activity II: The Study Question HSAG Evaluation Criteria States the problem to be studied in simple terms. Is answerable. In general, the question should illustrate the point of: Does doing X result in Y? 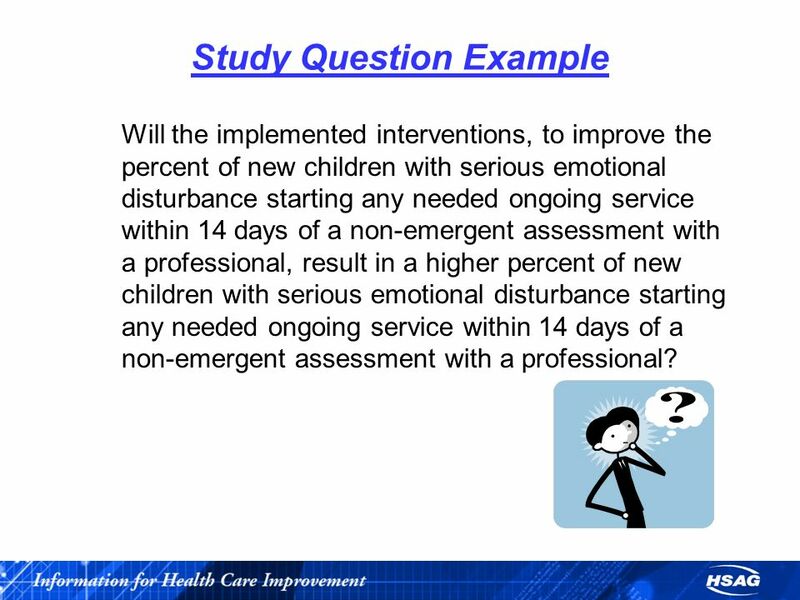 5 Study Question Example Will the implemented interventions, to improve the percent of new children with serious emotional disturbance starting any needed ongoing service within 14 days of a non-emergent assessment with a professional, result in a higher percent of new children with serious emotional disturbance starting any needed ongoing service within 14 days of a non-emergent assessment with a professional? 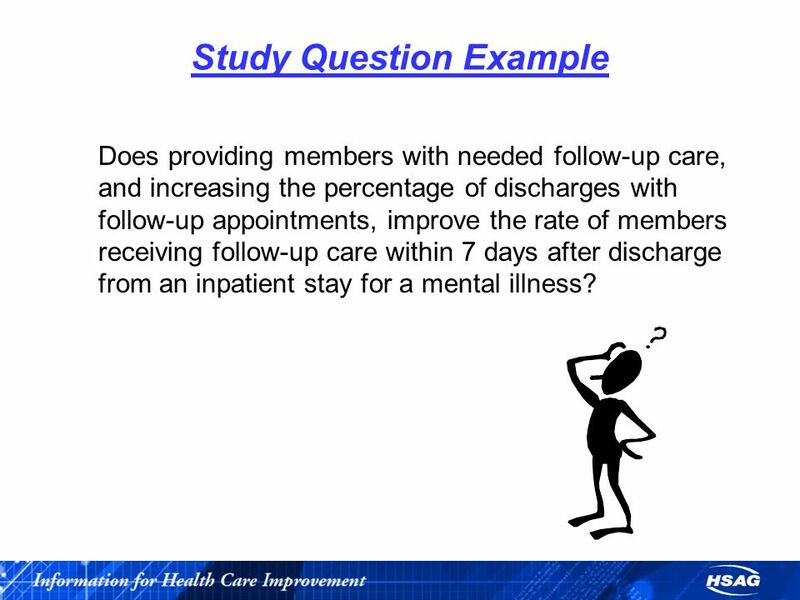 6 Study Question Example Does providing members with needed follow-up care, and increasing the percentage of discharges with follow-up appointments, improve the rate of members receiving follow-up care within 7 days after discharge from an inpatient stay for a mental illness? 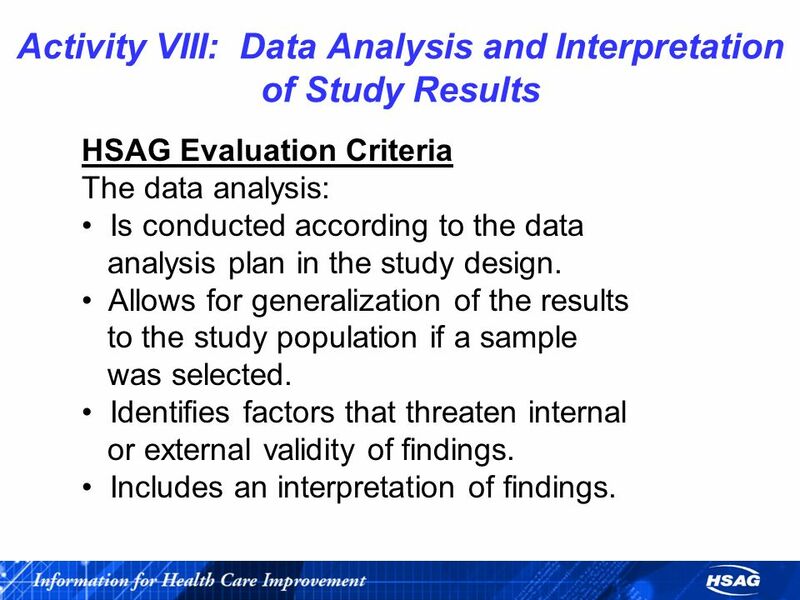 7 Activity III: Selected Study Indicators HSAG Evaluation Criteria The study indicator(s): Is well defined, objective, and measurable. Is based on practice guidelines, with sources identified. 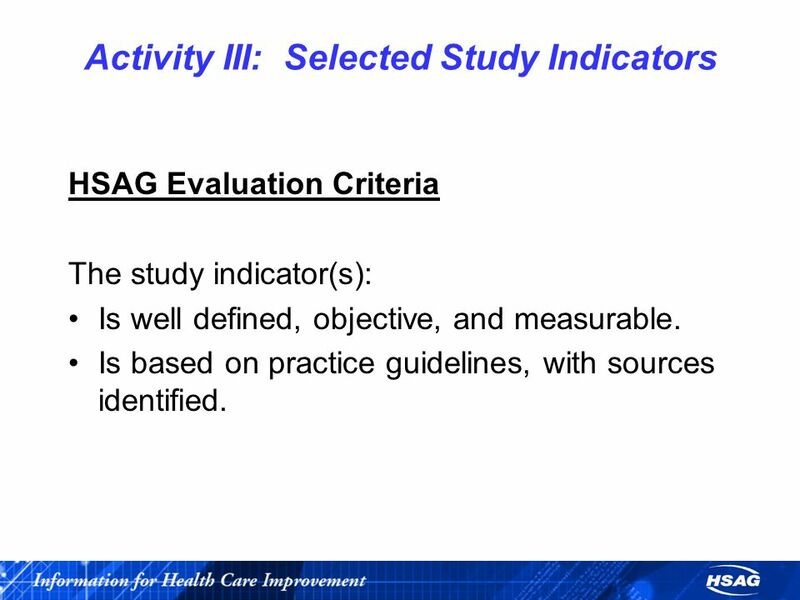 8 Activity III: Selected Study Indicators HSAG Evaluation Criteria (cont.) The study indicator(s): Allows for the study question to be answered. 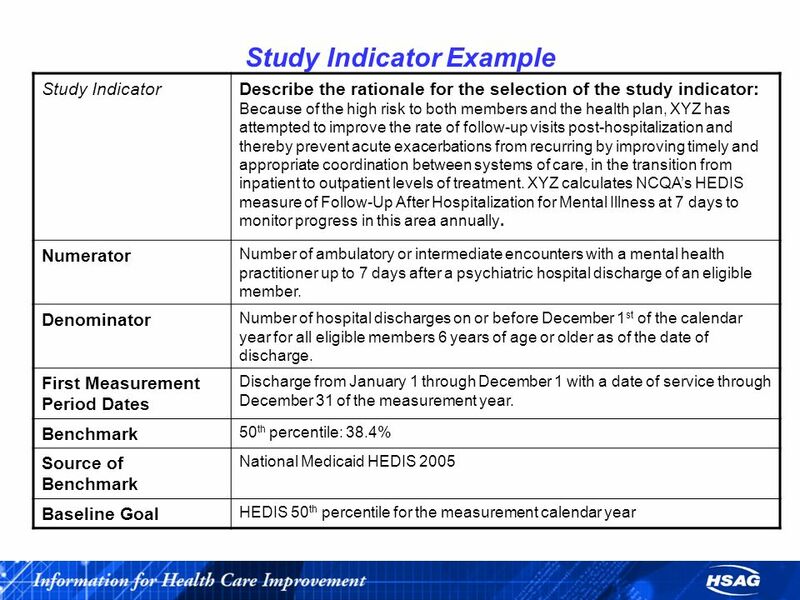 Measures changes (outcomes) in health or functional status, member satisfaction, or valid process alternatives. 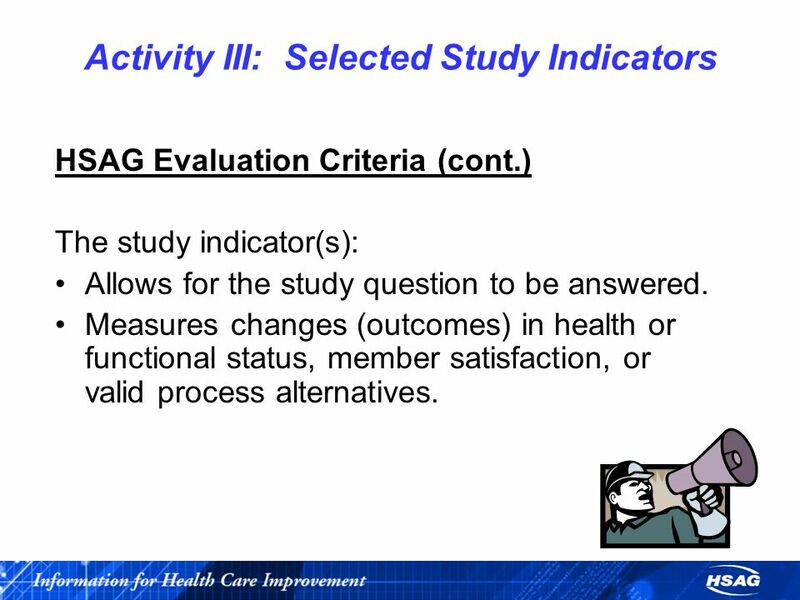 9 Activity III: Selected Study Indicators HSAG Evaluation Criteria (cont.) 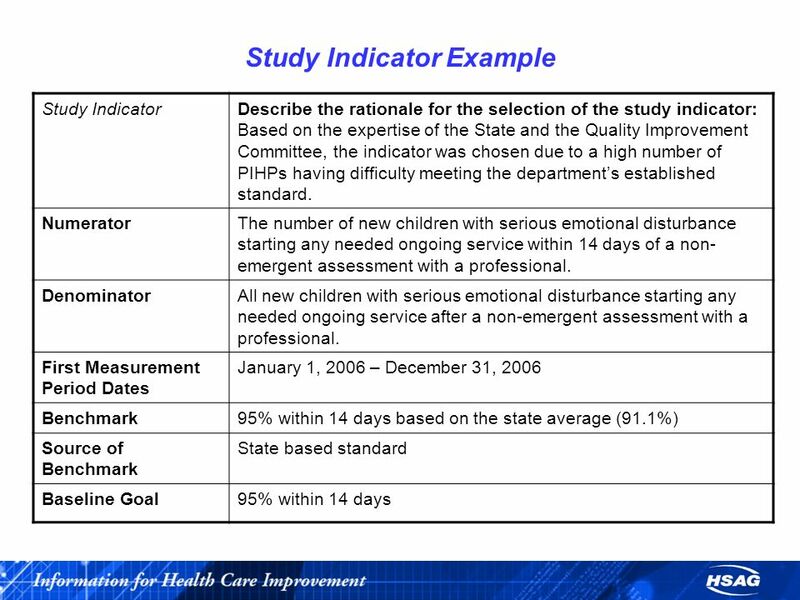 The study indicator(s): Has available data that can be collected on each indicator. Is a nationally recognized measure such as HEDIS ®, when appropriate. Includes the basis on which each indicator was adopted, if internally developed. 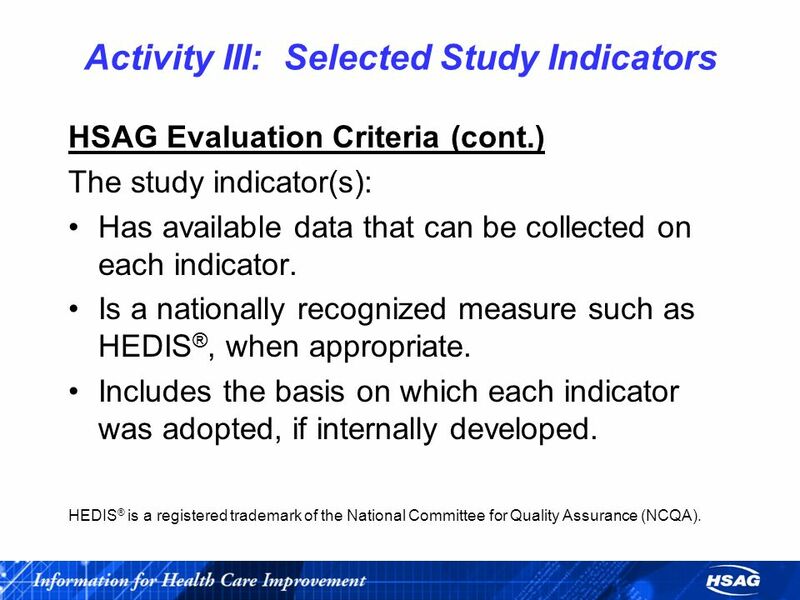 HEDIS ® is a registered trademark of the National Committee for Quality Assurance (NCQA). 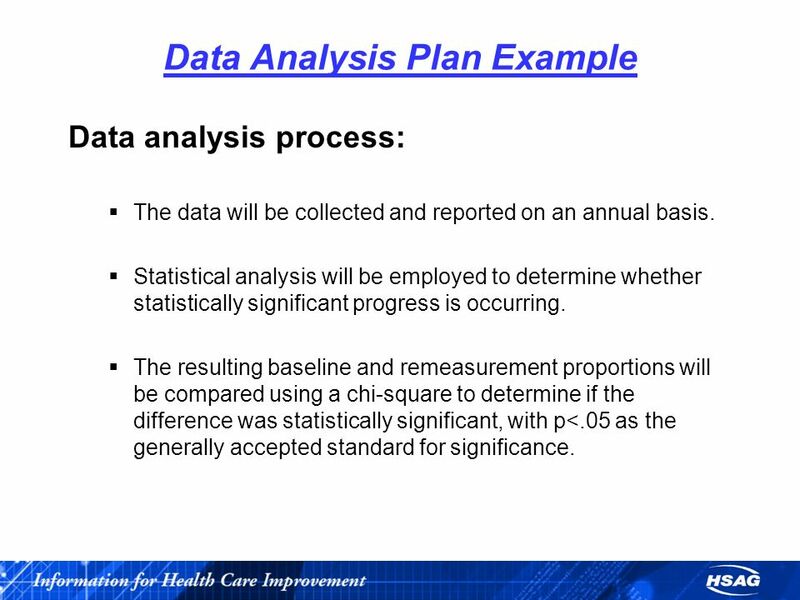 14 Data Analysis Plan Example Data analysis process: The data will be collected and reported on an annual basis. Statistical analysis will be employed to determine whether statistically significant progress is occurring. The resulting baseline and remeasurement proportions will be compared using a chi-square to determine if the difference was statistically significant, with p<.05 as the generally accepted standard for significance. 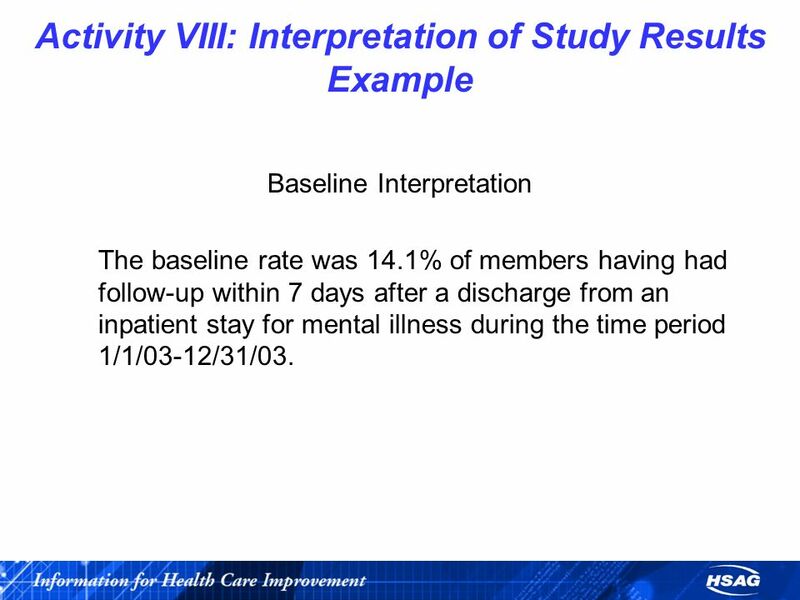 15 Activity VIII: Interpretation of Study Results Example Baseline Interpretation The baseline rate was 14.1% of members having had follow-up within 7 days after a discharge from an inpatient stay for mental illness during the time period 1/1/03-12/31/03. 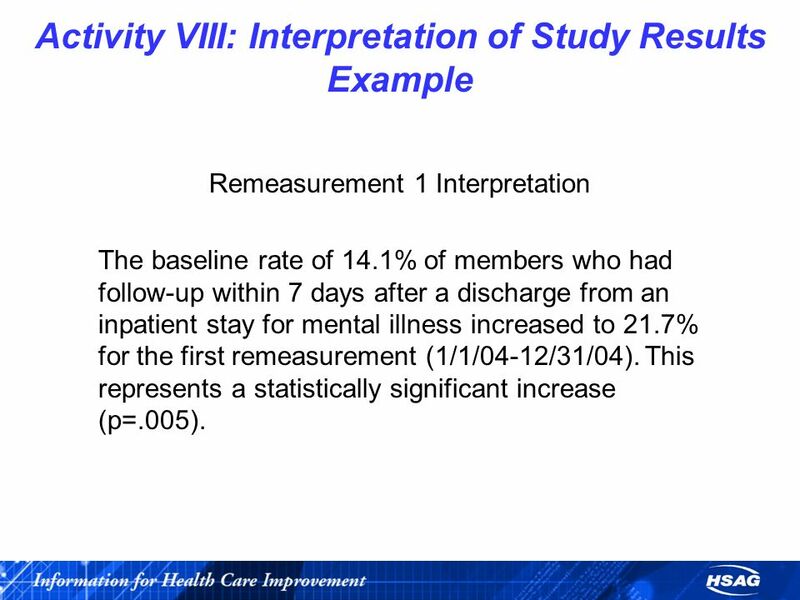 16 Activity VIII: Interpretation of Study Results Example Remeasurement 1 Interpretation The baseline rate of 14.1% of members who had follow-up within 7 days after a discharge from an inpatient stay for mental illness increased to 21.7% for the first remeasurement (1/1/04-12/31/04). This represents a statistically significant increase (p=.005). 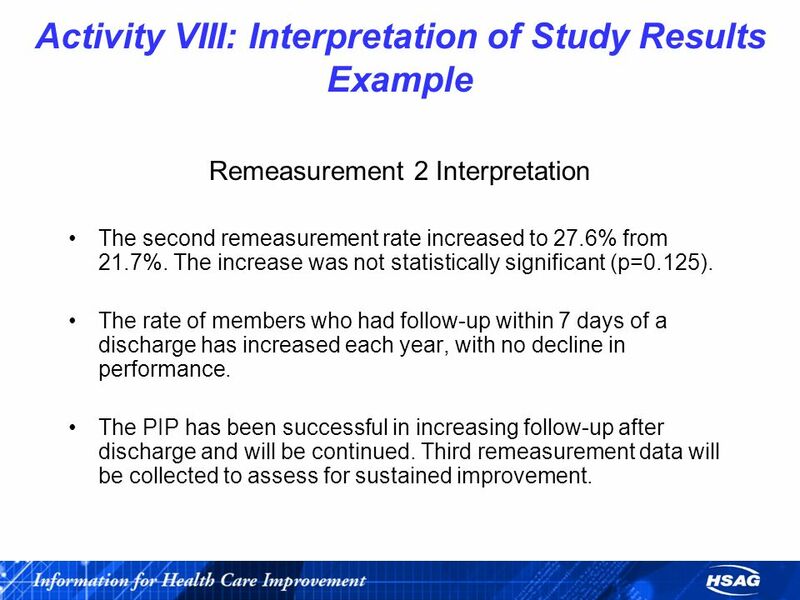 17 Activity VIII: Interpretation of Study Results Example Remeasurement 2 Interpretation The second remeasurement rate increased to 27.6% from 21.7%. The increase was not statistically significant (p=0.125). The rate of members who had follow-up within 7 days of a discharge has increased each year, with no decline in performance. The PIP has been successful in increasing follow-up after discharge and will be continued. Third remeasurement data will be collected to assess for sustained improvement. 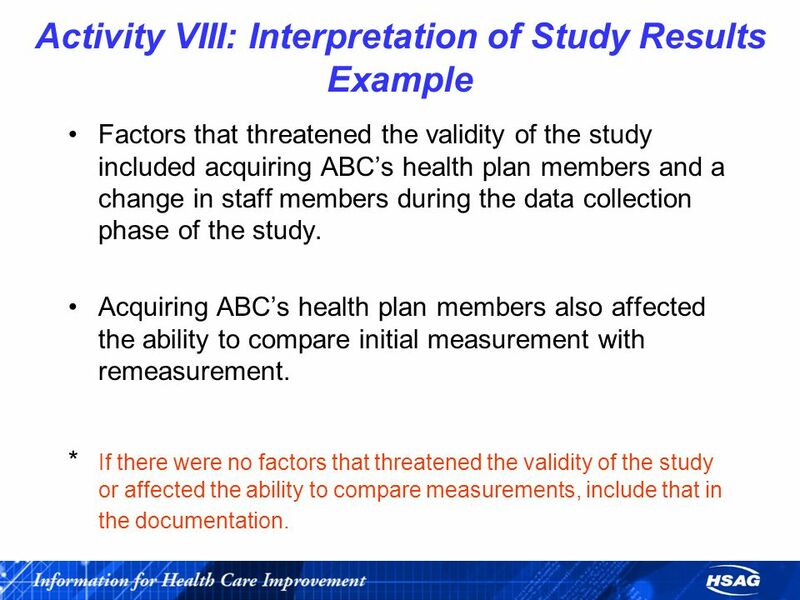 18 Activity VIII: Interpretation of Study Results Example Factors that threatened the validity of the study included acquiring ABCs health plan members and a change in staff members during the data collection phase of the study. 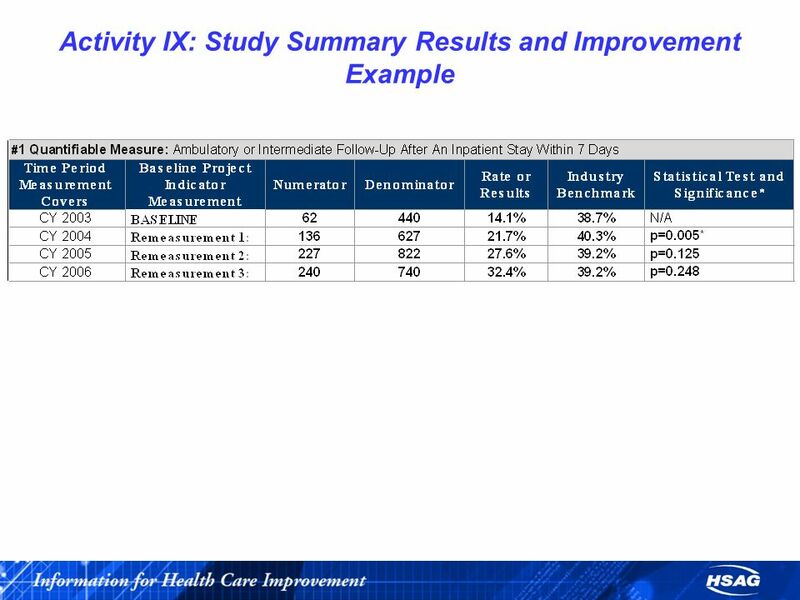 Acquiring ABCs health plan members also affected the ability to compare initial measurement with remeasurement. 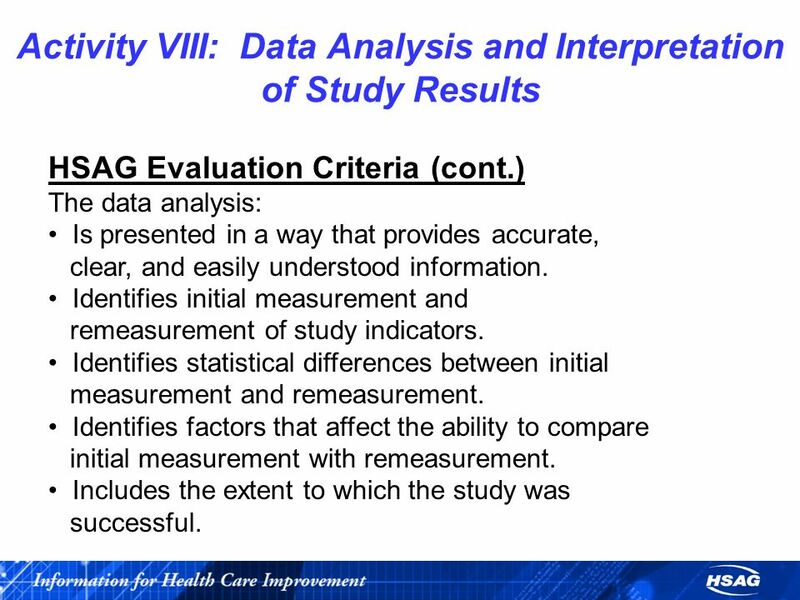 * If there were no factors that threatened the validity of the study or affected the ability to compare measurements, include that in the documentation. 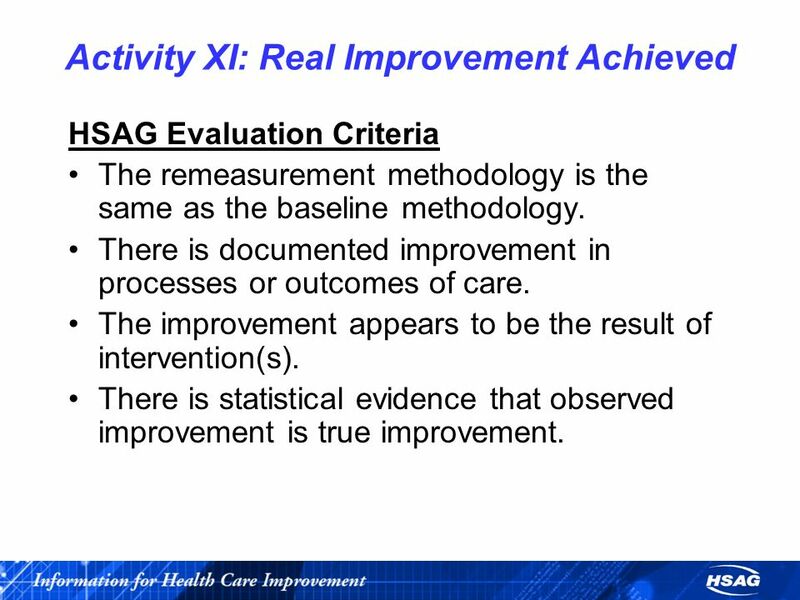 19 Activity XI: Real Improvement Achieved HSAG Evaluation Criteria The remeasurement methodology is the same as the baseline methodology. There is documented improvement in processes or outcomes of care. The improvement appears to be the result of intervention(s). There is statistical evidence that observed improvement is true improvement. 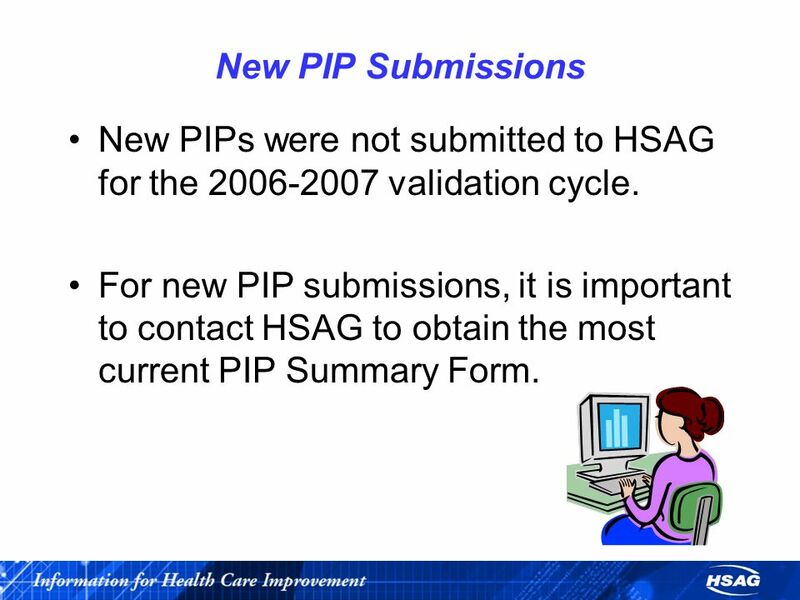 21 New PIP Submissions New PIPs were not submitted to HSAG for the 2006-2007 validation cycle. For new PIP submissions, it is important to contact HSAG to obtain the most current PIP Summary Form. 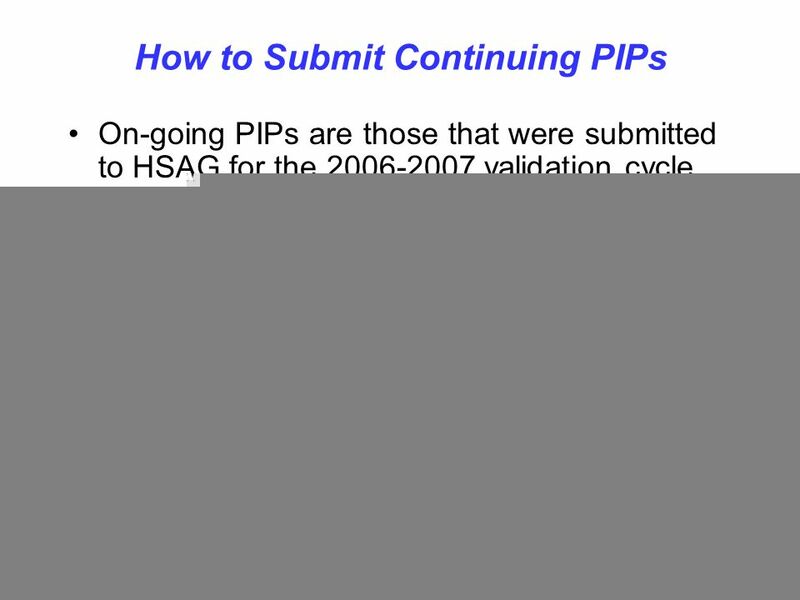 22 How to Submit Continuing PIPs On-going PIPs are those that were submitted to HSAG for the 2006-2007 validation cycle. 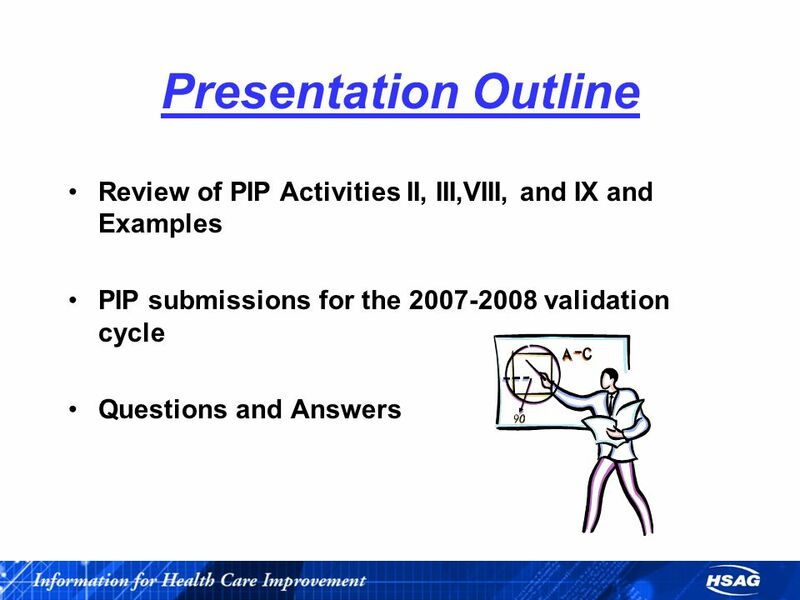 Highlight, bold, or add text in a different color, and date any new information that is added to the existing PIP Summary Form. Strikethrough and date any information that no longer applies to the PIP study submission. Ensure all Partially Met and Not Met evaluation elements from the previous validation cycle have been addressed in the documentation. 23 PIP Tips 1.Complete the demographic page before submission. 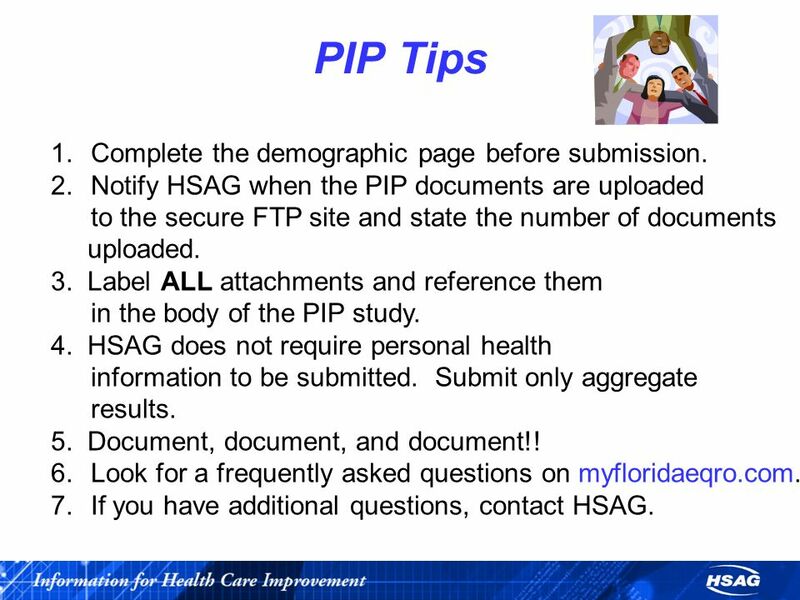 2.Notify HSAG when the PIP documents are uploaded to the secure FTP site and state the number of documents uploaded. 3. Label ALL attachments and reference them in the body of the PIP study. 4. 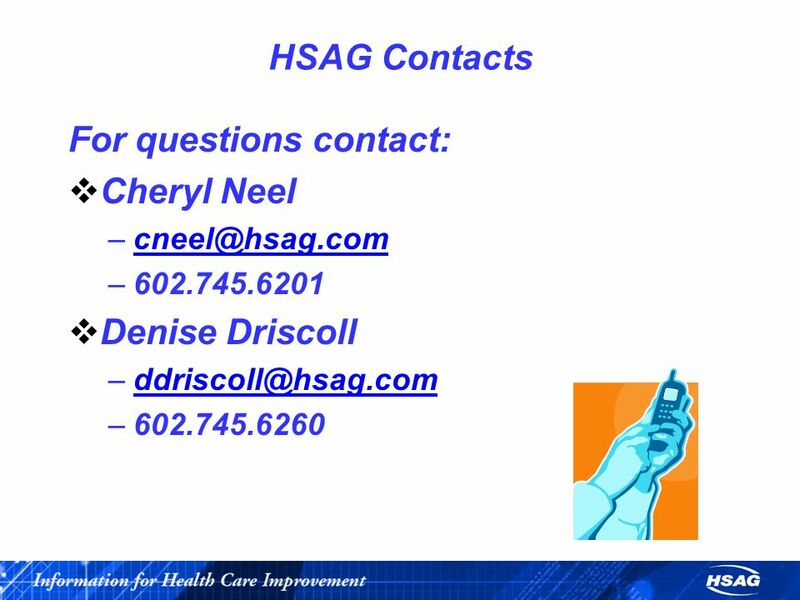 HSAG does not require personal health information to be submitted. Submit only aggregate results. 5. Document, document, and document!! 6.Look for a frequently asked questions on myfloridaeqro.com. 7.If you have additional questions, contact HSAG. 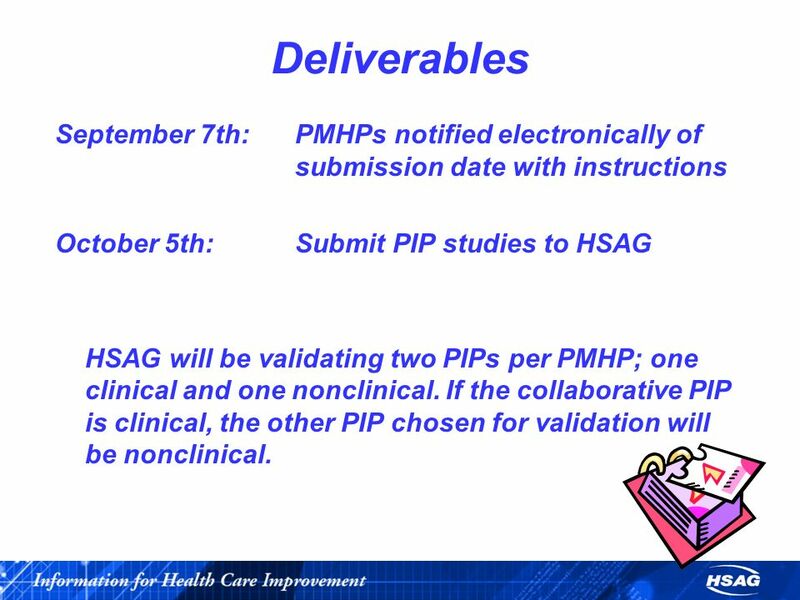 24 Deliverables September 7th:PMHPs notified electronically of submission date with instructions October 5th:Submit PIP studies to HSAG HSAG will be validating two PIPs per PMHP; one clinical and one nonclinical. If the collaborative PIP is clinical, the other PIP chosen for validation will be nonclinical. 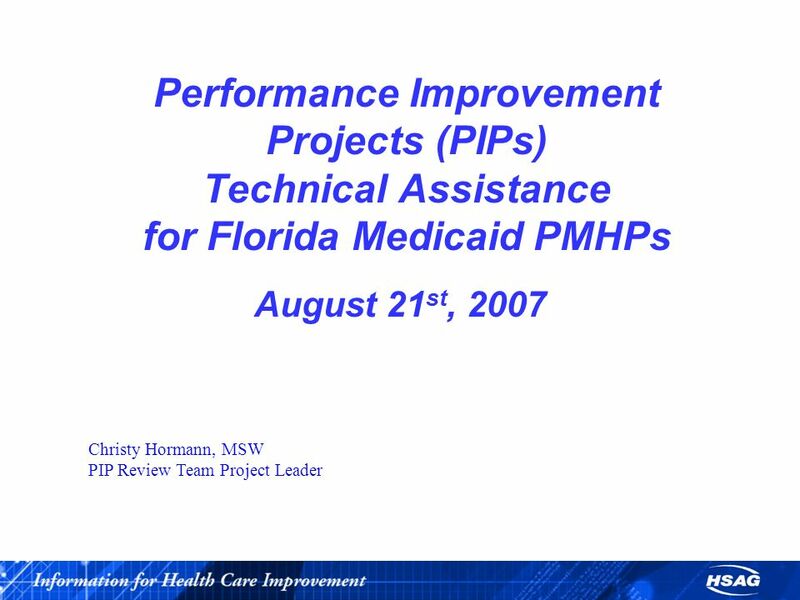 Download ppt "Performance Improvement Projects (PIPs) Technical Assistance for Florida Medicaid PMHPs August 21 st, 2007 Christy Hormann, MSW PIP Review Team Project." HSAG Performance Improvement Projects Using Data to Develop Interventions and Statistical Testing to Evaluate Results Breakout Session #1 Florida EQR. 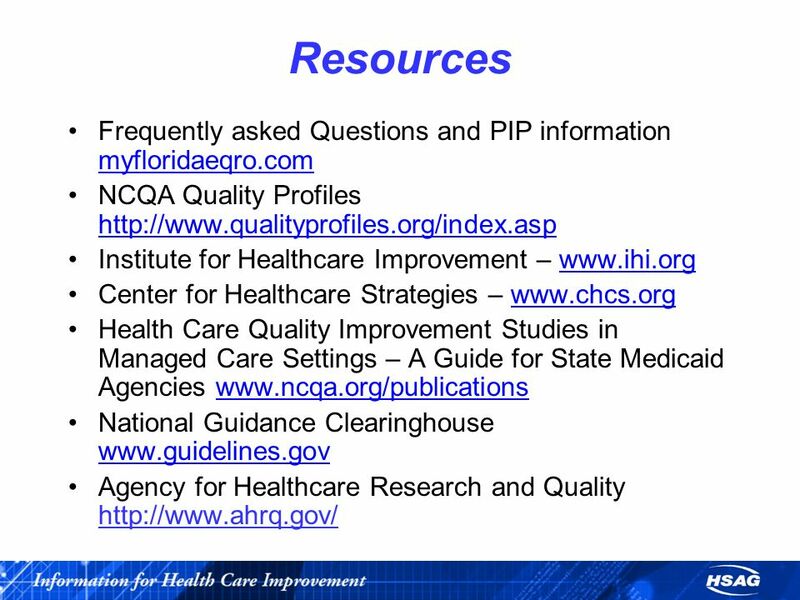 WELCOME to the PIP Technical Assistance Training for Florida HMOs/PSNs We will begin shortly. Please place your phone on mute, unless you are speaking. General Supervision Overview of State Performance Plan Indicators 15 – General Supervision 20 – Timely and Accurate Data. MCO Participation in External Quality Review Mandatory Activities During the SMMC Transition October 30, 2013 Presenter: Mary Wiley, BSW, RN, M.Ed. Project. Ministry of Public Health and Sanitation Ministry of Medical Services PERFORMANCE REPORTING 1. Understanding Meaningful Use Presented by: Allison Bryan MS, CHES December 7, 2012 Purdue Research Foundation 2012 Review of Stage 1 and Stage 2. Health Services Advisory Group, Inc. 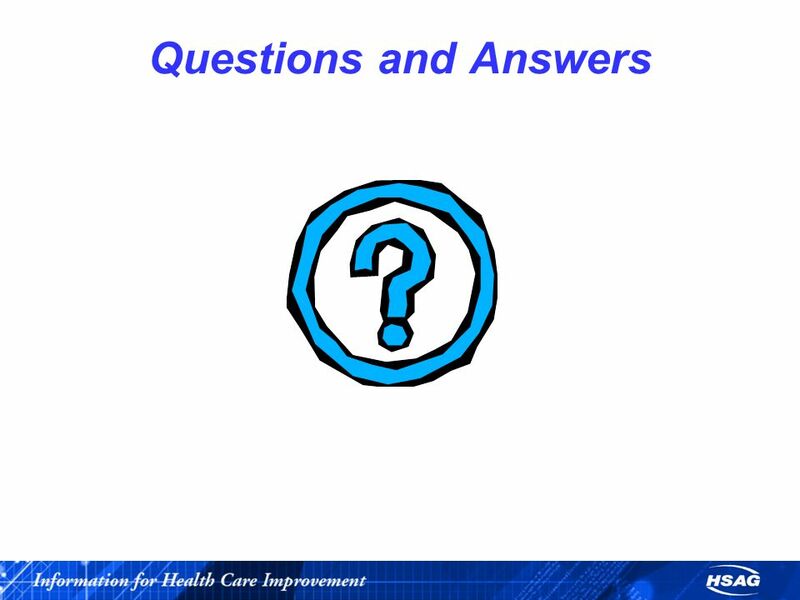 Performance Improvement Projects Nursing Home Diversion Program Where Are We Now? Concurrent Breakout Session #2 Florida. External Quality Review Quarterly Meeting Tuesday, September 26, p.m. – 3:30 p.m.
Bree Collaborative Cardiology Report: Appropriateness of Percutaneous Cardiac Interventions (PCI) Bree Collaborative Meeting November 30, 2012. Quality Improvement Strategies Root Cause and Subgroup Analyses. 2.11 Conduct Medication Management University Medical Center Health System Lubbock, TX Jason Mills, PharmD, RPh Assistant Director of Pharmacy. A Model to Reduce Acute Care Readmissions Susan Weber, RN Chief Nursing Officer Angela Venditte, LPN, CMCO Assurance HealthCare. HEDIS Audit – Appropriate Monitoring and Oversight of Vendors Presenter: Yolanda Strozier, MBA Project Manager, EQRO Services. Critical Appraisal (CA) I Prepared by Dr. Hoda Abd El Azim.